The title should probably read: Why a Tablet is Better than a Laptop...sometimes. When smartphones came out, I couldn't fathom being on the internet on such a small screen. The iPhone certainly won me over. When tablets emerged, I couldn't see why I would want one. If I want a big screen, I have a laptop, if I want a small screen I have my phone, why would I need an in between? Currently, I have a Nexus 7 and Husband has an iPad. I've found that a tablet has a very specific niche in my life. 1. When you want to really recline. If I'm not feeling well, or tired, or really want to stretch out on the couch or bed, the tablet is much more convenient than balancing a laptop and angling the screen perfectly to be able to see. 3. When you're doing graphic heavy activities or precision gaming. The screen size of the tablet makes Pinterest, Instagram, etc. much more enjoyable than on the small smartphone screen, and much more portable and comfortable than a laptop. Also, games that require precision pressing or swiping, are easier to play on a larger screen. 4. When you're on the go for an extended period of time. When you know you're going to be sitting somewhere for an extended period of time, too much time to look at a small screen, but not long enough to whip out a laptop, a tablet comes in handy. Tablet are good for occurrences like waiting in a hospital, where you're likely to moving from place to place often, but waiting for a while as well. Which do you prefer? 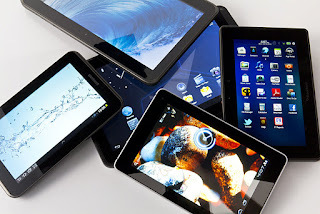 Smartphone, tablet, or laptop? I agree! I use my tablet more than I use my iPhone or my laptop. Because most people I text have iMessage I mostly text on my tablet, sometimes I even forget to bring my phone with me places. I can read books and files more easily on my tablet then my computer and because I have a word editing program... yeah, my tablet does pretty much everything. It is nice to have my laptop to type more quickly when I am doing longer things. Totally, an actual keyboard will always be the best when typing lengthy things. I will be looking into getting a tablet, probably an iPad, next year, when I will be in Europe for a month or so. That's a good idea, it'd be nice to have while traveling. I guess for my eyes' sake, I like desktops and laptops. I strain my eyes if I look at my phone for too long. Tiny screens don't really love me. lol. I'd have to say when I'm not using my computer, I use mostly my phone, though my tablet is third.